Home > Articles > Does it really matter how many people were at your wedding, or how much you spent?? You may have seen articles everywhere recently, saying that success factors for a lasting marriage include everything from a cheap wedding, to a large number of people in attendance, to what you thought about your partner’s looks! I was so curious, I took a look at the actual study behind all those articles (A Diamond is Forever And Other Fairy Tales), which was conducted by economists at Emory University. The study’s authors present their study very narrowly: they were trying to look at whether spending a lot on a wedding correlates to more likely divorce. But in the end, they found a host of success and failure factors, some of which are very meaningful to leaders, counselors, pastors and groups that work in the marriage and family arena. Attending worship services and having a supportive community matter! The lines in red are factors that are important for those working with marriages and families, because they prove that what we are trying to encourage truly matters. 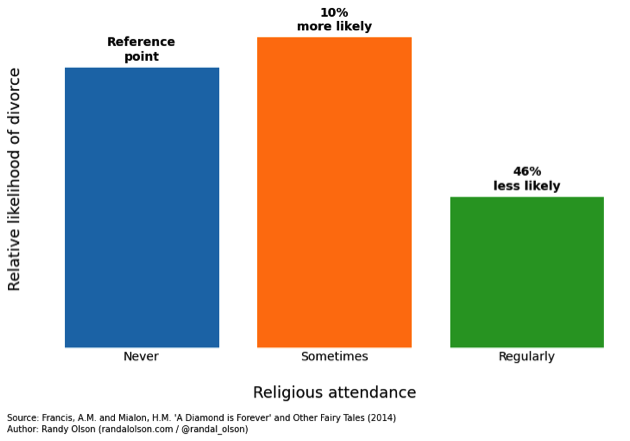 In other words, the data says: Going to church matters. Creating family bonds and staying together for the children matters. Having a community of supportive friends and family matters. Prioritizing your marriage and time together matters (the decision to prioritize a honeymoon – no matter your income level — signals something about purposefully prioritizing your marriage). I’ve copied two graphs about those factors, below. But first, here’s a quick note about where those graphs come from. One of the most interesting articles about the study is by Randy Olson (a popular data scientist), who created seven easy-to-read graphs from the highly technical study data. At which point, the dry research study from a month earlier that had been completely ignored, became one of the most popular stories discussed in the news. (It’s all about the presentation, right? …Crazy enough, your wedding ceremony has a huge impact on the long-term stability of your marriage. 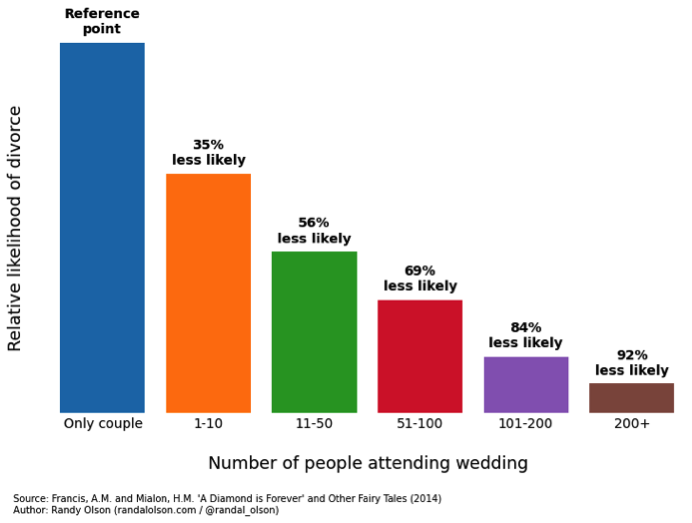 Perhaps the biggest factor is how many people attend your wedding: Couples who elope are 12.5x more likely to end up divorced than couples who get married at a wedding with 200+ people. Clearly, this shows us that having a large group of family and friends who support the marriage is critically important to long-term marital stability. Take a look at this last graph for a minute. If you had more than 100 people at your wedding, you are 84% less likely to divorce, than if you took your vows alone. That says something incredibly powerful about community – and should greatly reassure every pastor who conducts a wedding where the chairs are filled with supportive family and friends. You might think to yourself, Well, did they have a big wedding simply because they have a higher income, which itself lowers the chance of divorce? Not so fast. Turns out, the researchers found that spending more on the wedding is associated with a higher risk of divorce. The people with lowest risk, had a big wedding, where they spent under $10,000. Is the average cost of weddings today really $30,000? One other quick note. Randy Olson shared the same number that has been all over the news recently: that the average wedding today costs $30,000. That sure sounds crazy and a bit discouraging for people who have nowhere near that much to spend. Here’s the truth: the survey that came up with that $30,000 number was extremely skewed: it was conducted on the site of TheKnot.com, a high-end wedding site! It does not appear to be representative. By contrast, the Emory researchers’ study (which was largely representative) found that among their sample, a full half of respondents spent $5,000 or less! Yet another lesson in looking closely at the data, before we assume that negative news about marriage is true. When Tally Whitehead and I were writing The Good News About Marriage, we were encouraged to see that so much of the data out there confirms both that 1) marriage in general is much healthier than we’ve all believed, and 2) that all the effort people are putting in to support and help marriages does work! It is very encouraging to see yet another study, yet another independent and seemingly-robust data source, that confirms that yet again. Do you want Shaunti to share these life-changing truths at your church or event? 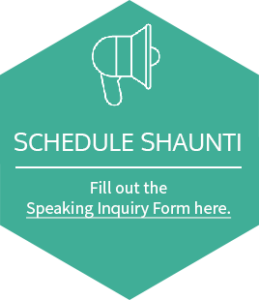 Inquire about Shaunti speaking, here.